Baked Spaghetti has all the flavors of spaghetti, and way easier to eat. No more slurping noodles! The eggs and parmesan flavorfully bind the noodles together so you can cut it with a fork. I’m always on the lookout for easy and cheap dinners, and this Baked Spaghetti hits all the boxes! Regular ol spaghetti is a go-to easy dinner for most families. But it can be hard for little kids to eat without making a huge mess. Lots of slurping noodles and toddlers using their fingers. And that red sauce stains!! Baked Spaghetti is the answer! It is basically spaghetti but in an easier to eat form. The eggs and parmesan bind the noodles together so you can cut it with a fork. Its great for feeding crowds as well, just slice and serve! And I might even go so far as to say that it has even more flavor that regular ol spaghetti, because of the flavors added to the noodles. Baked Spaghetti is also a great way to use up a bit of leftover spaghetti sauce from earlier in the week. This meal is easily under $5 for a whole family, so its a perfect meal when you’re trying to stretch the budget. Noodles are about a $1, a jar of sauce is around $2, and eggs and cheeses add up to less than $1. Which means you can also add a loaf of french bread. Ya’ll know I loooooove french bread. 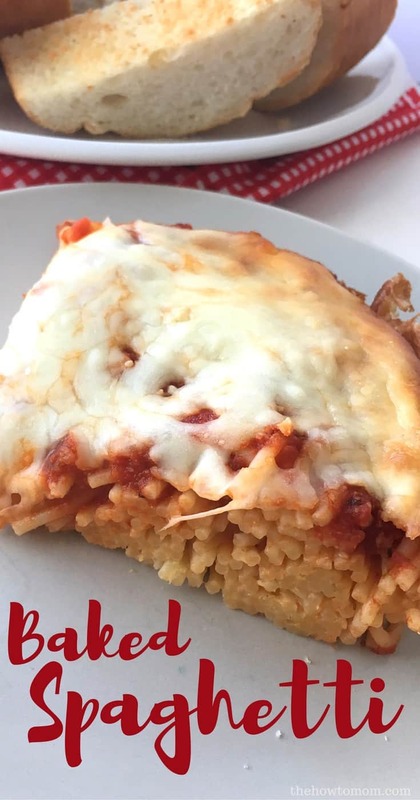 Baked Spaghetti has all the flavors of regular spaghetti, and lots easier to eat! The eggs and parmesan bind the noodles together so you can cut it with a fork. The cheesy topping is irresistible! Preheat oven to 350. Lightly grease 9×13 dish. Prepare spaghetti noodles as directed. 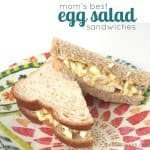 In a small bowl, combine eggs, parmesan and seasonings. Pour mixture over cooked and cooled spaghetti noodles and toss to coat. Pour noodles into 9x13 dish, and spread noodles evenly on the bottom. Spread marinara or spaghetti sauce on top of noodles. Top with mozzarella cheese and more parmesan. Bake for 30-45 mins, until bubbly and starting to brown. Let sit for 5 minutes to allow noodles to set up a bit. 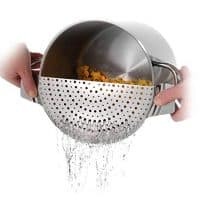 Westmark 16392260 Stainless Steel Pan Pot Strainer with Recessed Hand Grips Suitable For All Sizes Up to 10"
« High Protein Snacks for Kids – Energy on the Go!